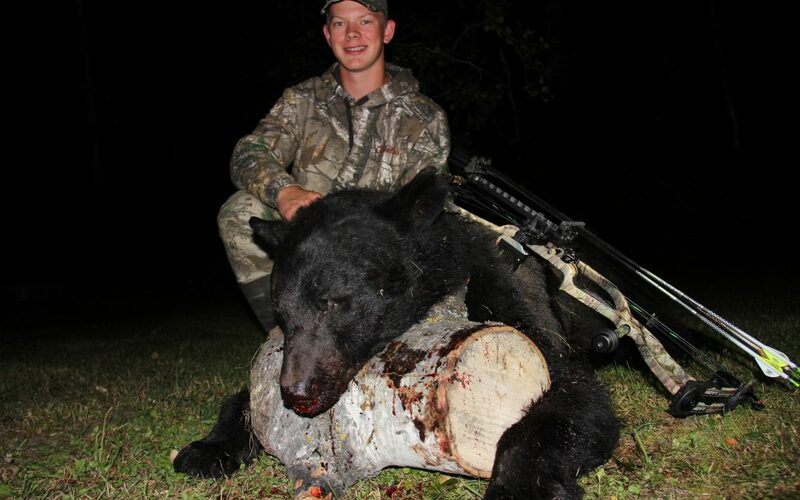 A few years ago I met a young man who had just inherited a large bear hunting concession from his grandfather. I worked out a deal with him where I could have the first week of bear season exclusively to my group if I filled up the camp with friends. We do much of the baiting and hanging treestands, etc. We are also responsible for getting ourselves to and from the stands, getting our bear out, etc. In exchange for that we get a good deal on the hunts. I call it a semi-guided hunt for lack of a better term. I normally bring ten hunters but this year I had two back out at the last minute; one had back surgery and one had a broken ankle so we had eight hunters. Everyone saw bears every evening and we were done by the fourth day with all eight tagging a bear. I videoed my hunt as usual and my nephew Corban flew out from Oregon to be a part of the hunt this year. Because he came so far and because he’s probably on the hunt of a lifetime, I put him on the bait which had an old mature boar with what appears to be a P&Y head. He shot the bear the first night. He did a nice job with the video too. For more info on this hunt, visit Wilson’s Havik Lake Outfitters. I’ve got the first week booked up again for 2018.